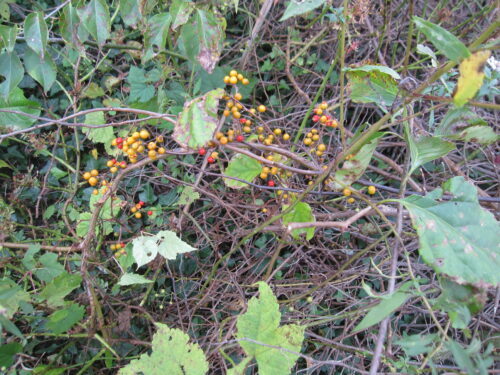 The vine of oriental bittersweet aggressively entwines and smothers trees and other plants; roots are bright orange; flowers small and greenish-yellow; and fruits are pea-sized capsules that change from green to bright yellow and split open when ripe, revealing a bright red berry within. 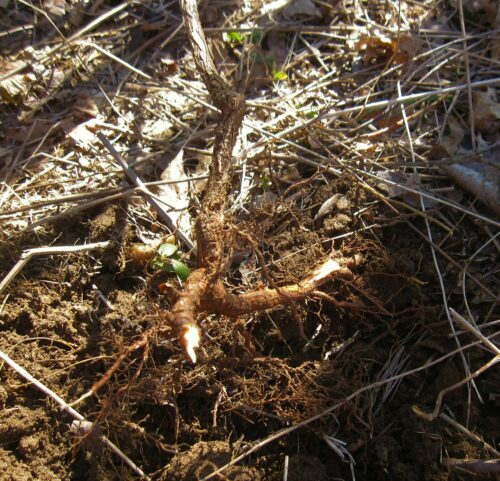 For small bittersweet vines, their bright orange roots should be uprooted with the help of large pliers . Once uprooted, vines can remain to die on the host tree if prior to fruiting. Vines with berries, which will survive through the winter, should be removed, bagged and disposed. Click Vine Removal for details. Cut very large vines at or near the ground with a folding limb saw, battery operated sawzall (reciprocating saw with limb saw blade) or even a chain saw for excessively thick vines. 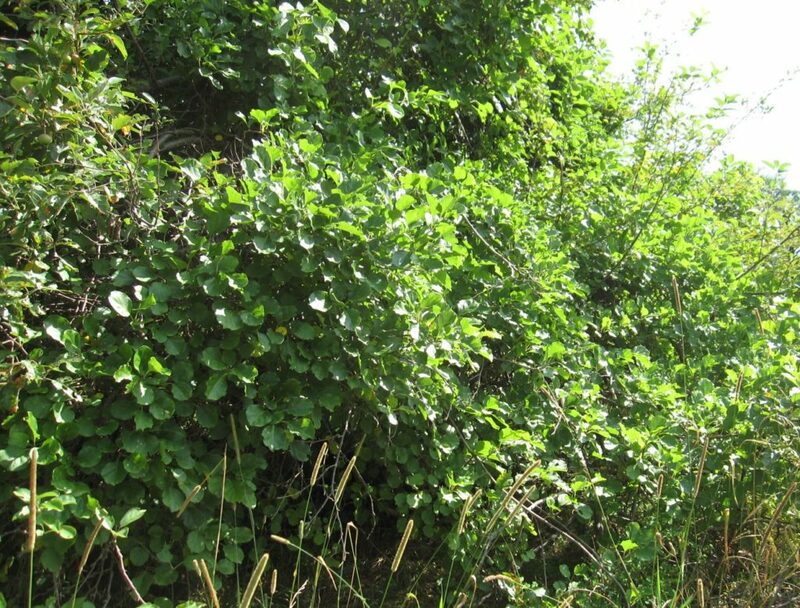 Unless vines have berries, the severed vines may be left in place to dry. 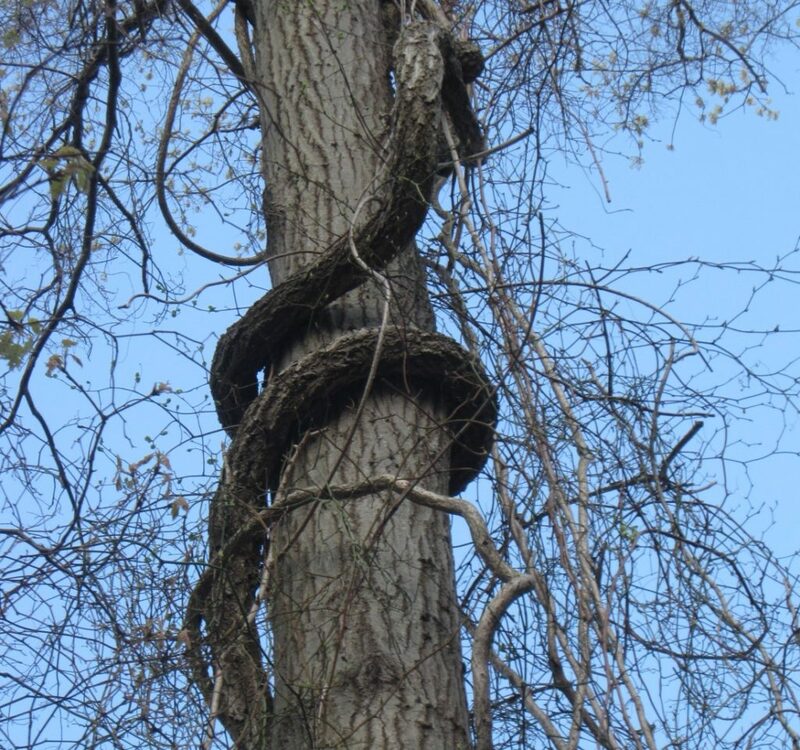 This very mature Oriental bittersweet vine resembles a python strangling its prey. Because the root remains in the ground, wrap and tie a black plastic bag around the stump, or staple black plastic sheeting into the ground over the cut with landscape staples, and allow the plastic to remain in place for a year.